As EUR is getting stronger due to the economic reports, USD is under pressure. Today French Prelim GDP q/q, French Consumer Spending m/m, and German GfK Consumer Climate will be released in Eurozone along with the CB Consumer Confidence and S&P/CS Composite-20 HPI y/y in the US. The support rests at 1.19380 with resistance at 1.19980 which both lines are above the weekly pivot point at 1.18630. The EMA of 10 is moving with bullish bias along the ascendant channel and it is above the EMA of 200 and the EMA of 100. The RSI is moving in overbought area, the Stochastic is showing upward momentum and the MACD indicator is in positive territory. The ADX is showing buy signals. 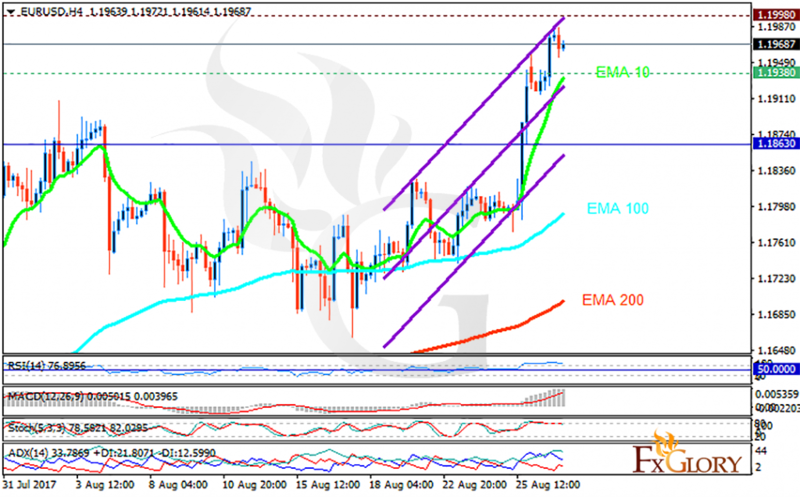 EURUSD will continue its upward trend towards 1.2 area including pullbacks on the way.